Subhash Vyam is a master sculptor. His wooden sculptures are three dimensional stories. He completely changed over to painting when he was awarded the Rajya Hastha Shilpa Puraskar for one of his ink drawings by the Government of Madhya Pradesh in 2002. He uses ink on canvass and paper his favourite themes are of aquatic life, which he saw while growing up in the village of Sonpuri, near Patangarh. 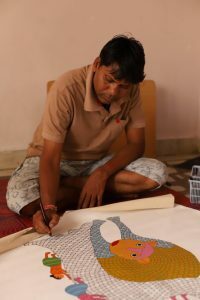 Inspired by his wife Durga Bai, who has a vast reservoir of folk tales, Subhash has also started painting characters and scenes from these stories.He uses the motif of seeds spread on peacock feathers. When Subhash Vyam holds his painting workshops, he has the additional advantage of being able to teach participants how to make clay and wooden figures as well.